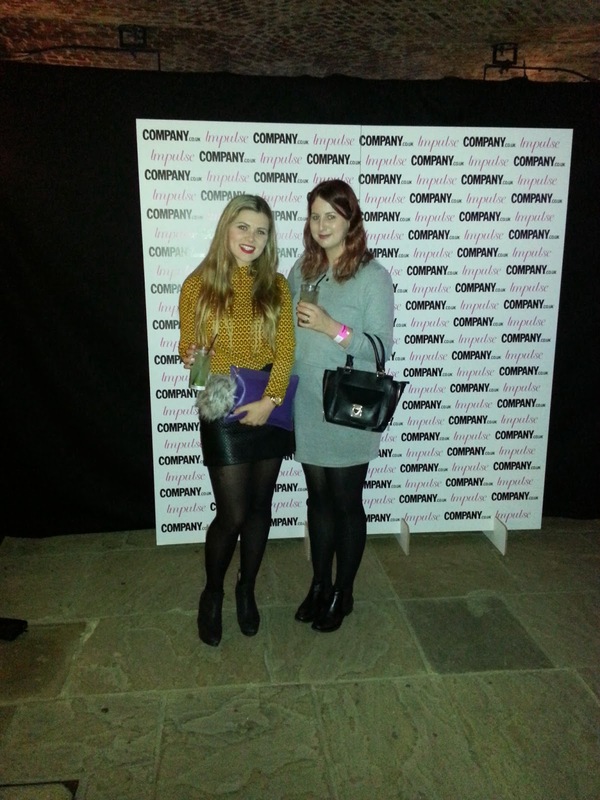 Last night I was lucky enough to spend my evening at the Company Magazine Bloggers Style the High Street event. 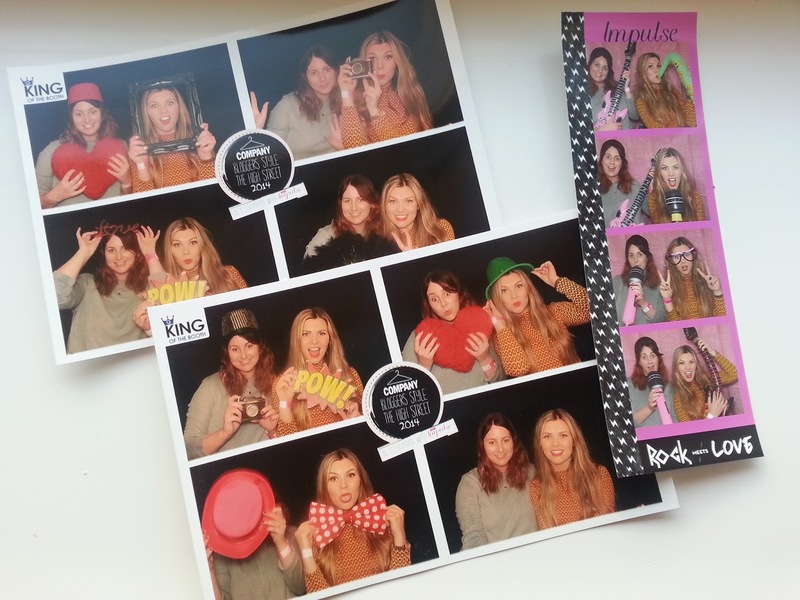 As you can see myself and Sam found both of the photo-booths as soon as we got there! This is the first of its kind for Company magazine and hopefully not the last, where the clothes on the catwalk were chosen by a group of well known bloggers, and who also styled the outfits to their own tastes. The venue was perfect! It was spacious and created a really nice atmosphere which was calm and fun. To top such a great evening off, we walked away from the event with a lovely goodie bag packed with wonderful things which was a delight to rummage through the next morning. 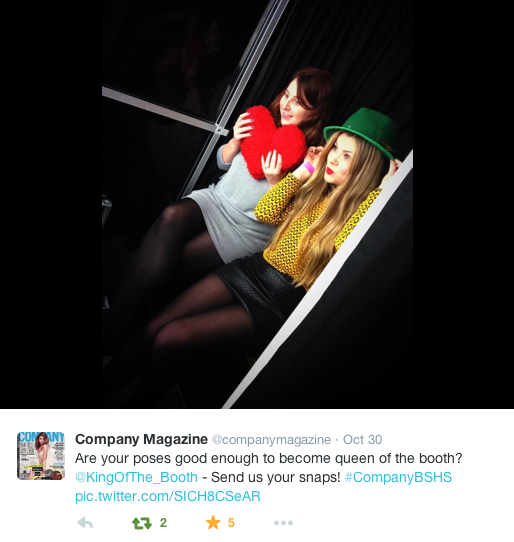 To top even the amazing goodie bag, mine and Sam's photo booth fun was tweeted by the amazing Company magazine! Day made! Were any of my lovely readers there? Did you enjoy it? Will you be going to the next one? Thanks for stopping by, hope you're having a lovely evening, see you tomorrow! 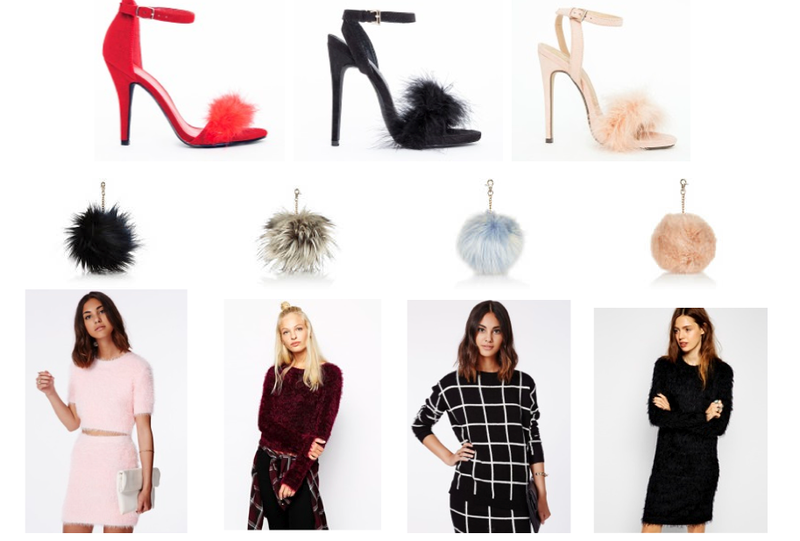 Wherever I turn I see fluffy keyrings, fluffy skirts, fluffy shoes, fluffy tops and fluffy coats. I have to say this trend is most definitely growing on me more and more, enough that I bought my very own keyring only yesterday. Some will love this trend and others will be thinking what's the big deal? Many of us add multiple textures to our outfits without even giving it a thought, by wearing something like a leather/pleather jacket and a denim skirt. This autumn /winter we are seeing a lot of FLUFF and brushed fabric and not just in the normal colours we are used to wearing this time of year. Amongst the black and burgundies there are pastels. Yes the pastel colours we loved oh so much spring/summer are still appearing. I'm not sure how I feel on wearing a whole fluffy outfit, top, skirt, coat and shoes, but changing up your wardrobe and adding a bit of fluff to it can add that little something extra. I feel it can make outfit look a bit more interesting and different during the time of year where people like myself hide away in black. But hiding away in a black fluffy jumper looks totally different. So will you be purchasing any fluffing items anytime soon? Or do you own anything already? My next fluffy purchase will be the Missguided Carrie black fluffy heels as pictured. I love them too much. Having a very heart shaped face I tend to feel the need to contour and highlight in order to get some definition into those 'chubby cheeks'. During the warmer months I tend to not use highlight as the natural sparkle of a dewy (sweaty) face does that for you. Now it's October and getting a bit colder my base is moving to the more matte look with a nice blush, and a touch of highlight. 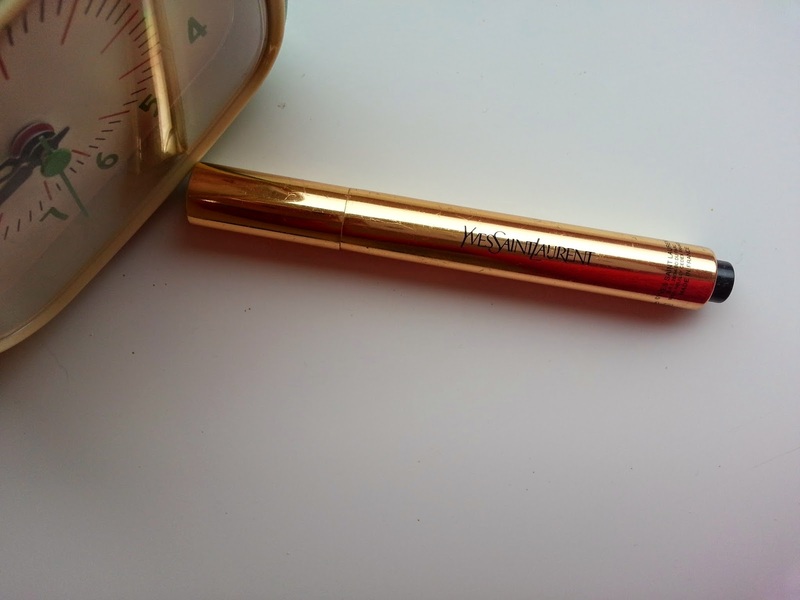 The man for that and what I am reaching for on a regular basis is my YSL Touche Eclat. I have a few fav highlighters that I go between however the finish of this makes it my number one for a liquid highlight. It's supposed to cover dark circles and everything however I still need to use concealer first, I guess my bags are too dark. Once its applied I like to dab it into the skin and it gives a very subtle touch of highlight, nothing too in your face. 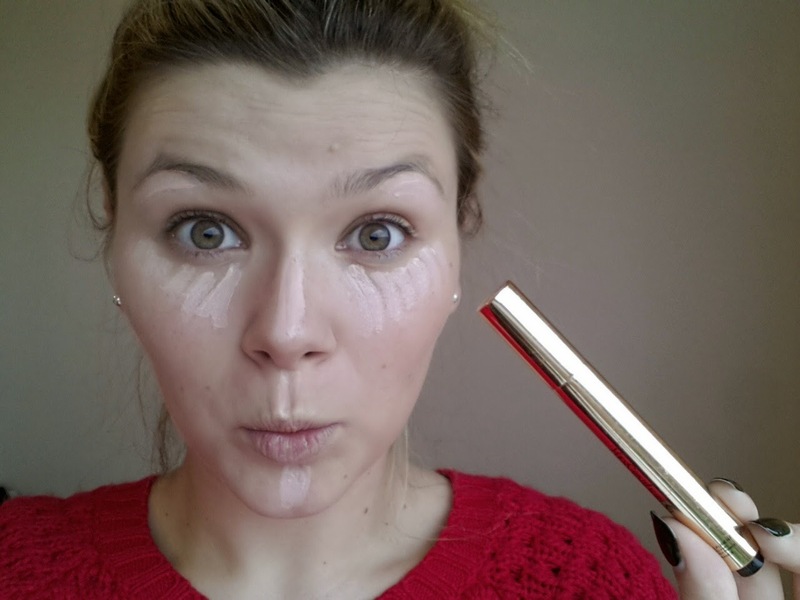 Its very easily wearable and could even be applied without a mirror as it blends in so quickly and effortlessly. If your happy to spend £25 on a good highlight that seems to last ages and that won't let you down, I would say go for it! Its a great product and great for newbies to the highlighter step as like I said its easy to work with and subtle. I am yet to try a Touche Eclat in the new variety of shades as this is the 'one colour fits all' one. There are cheaper products on the market including one that is slightly cheaper and one I would really like to try which is the Clinique Up costing £22. Do you have a go to highlight? I would love to know. I couldn't wait to wear my new skirt out, and what a perfect night to wear it. When going to music events at the O2 I don't like to not be covered as I find it can get a little chilly and by teaming some tights with the quite thin top was a good shout for when it got warmer. I seem to use this bag all the time wether it goes with my outfit or not......maybe a new one is in order? 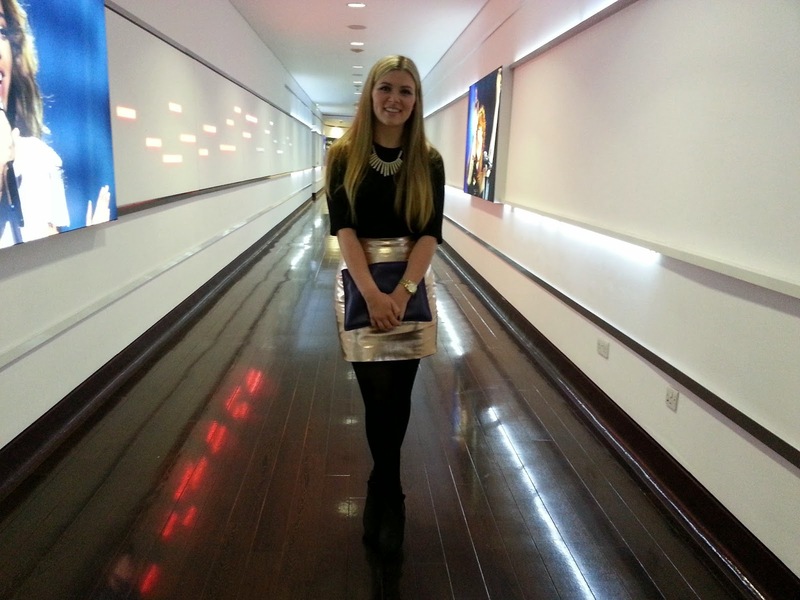 As soon as we entered the VIP walk way I asked my mum to snap a shot of my outfit and there were quite a few people behind us so had to hurry hence the slightly unfocused pic. The show was spectaular to watch, even for someone who isn't a fan there was so much to watch and take in. The only way I could possibly explain it was that it was like a circus. Dancers everywhere with crazy costumes, huge inflatable flowers, glitter, lights, balloons, the lot. Gaga had a hand full of costume changes and in my personal opinion she rocked them all. From a psychedelic rave look to a biker jacket and thong she looked great and danced and sang her heart out from start to finish. Having seen Gaga in the press and her videos for the past 6 years I knew I was going to be in for a treat for my eyes and ears without being a die hard fan. At one point in the show Lady Gaga was laying on a walkway after skidding on her knees at the end of a song an picked up a cuddly toy someone had thrown her. A note was attached which explained her battle with cervical cancer and how her music has helped her believe that she is strong and she was born to be brave and that her dream is to meet her and thank her. As my eyes welled up Gaga finished reading the letter and invited the girl to join her on the stage and sang a song for her and gave her a huge hug and kiss. Now I have seen a number of music concerts before and I have found it rare for this to happen. The fact that she acknowledged the stuffed toy was so thoughtful and meaningful. Overall I thoroughly enjoyed my evening at Lady Gagas artRAVE. She sang her heart out, danced till you could see her sweat dripping from her face and put on an immense show. Did anyone else go and see Gaga on her artRAVE tour? What did you think? Thanks for stopping by, enjoy the rest of your Sunday! 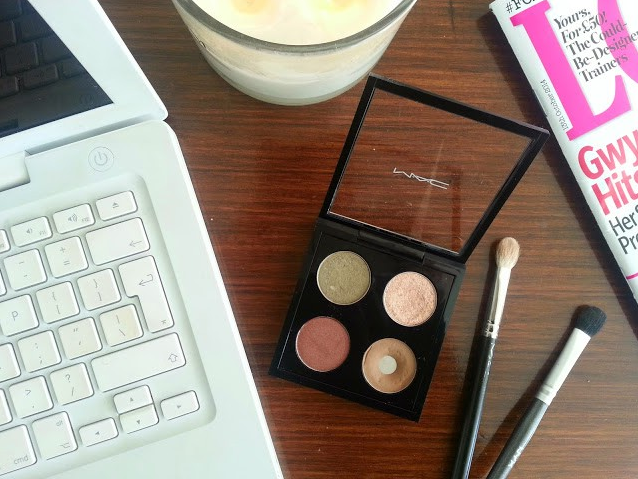 Make up from a brand like this is always going to feel luxurious but this really does feel lovely. It feels velvety and smoothes onto the skin nicely. It contains no SPF so great for photo taking and can be built up to a very high coverage foundation. This has been on my list for a while however after swatching it again yesterday it made my want more intense. Advent calendars are something that we all get as kids, and adults. But now I can't have anything containing dairy this seems perfect for me. I am a shellac lover however do give my nails a break every now and again and also paint my toe nails. It works exactly like any other advent except you get a new nail varnish every day!!! wowza! I've always wanted to own a Jo Malone fragrance because they are so worth the hype. As soon as I smelt this I instantly fell in love. Anything fruity and I'm there but there's a little something more to this other than orange. This scent is very spring/summer however would be a good one that can be worn daily. Having the candle to match would be a Brucie bonus. I haven't had a product like this for a while and have heard so much about it, so it's always been one that I have wanted to try. I have dry and sensitive skin which this is fine for. Its a deep cleansing treatment to refresh and diminish your clogged pores. Would be a nice addition to my Sunday evening routine. This has been on my wishlist for ages now and I still haven't taken the hit and bought them. 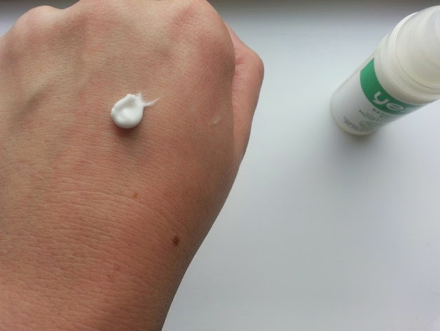 My skin in the winter gets dry patchy sections and seemed to react well with the serum. The idea of a mask of Hydraluron excites me a lot and would only be used the night before a special occasion. What's on your wishlist? Any of my items? I remember back in the day when I was starting secondary school I used to only wear a white and a bright blue eyeshadow. I would only apply it to my eyelids and not blend in any way and of course, I used to use the free sponge applicator. On special occasions I used to have half white and half blue...cool ey!? Oh how times have changed, and over the past four years I have tried and tried to perfect my blending technique, as I feel there is nothing worse than eyeshadow packed on without a good blend. I was reading a blog one day and watching the Youtube video that was linked which showed how easy is was to blend out your eyeshadow. Since then it was my mission to get it right. 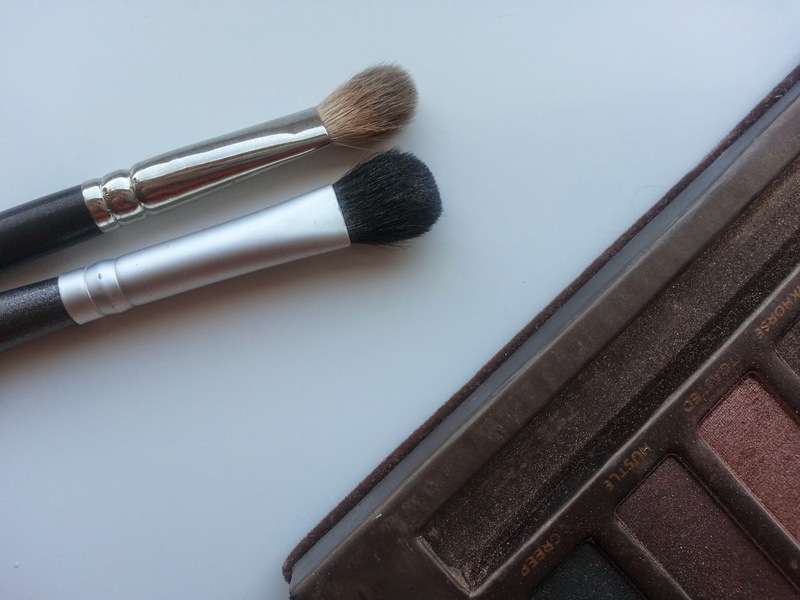 I purchased the MAC 217 as beauty bloggers at the time were raving about it and I have to say it has been one of my holy grail eyeshadow brushes since. It is so versatile that you can put eyeshadow on the lid by just sweeping it across the lid, or it can be also be used to blend. However my favourite thing to use this brush for is applying my crease colour in the socket. The bristles are fine, dense, and the oval shape fits perfectly into my eye socket. Using a circular motion and going into the nose and out it does most of the work for you and really does blend your shades together nicely. As I use this for my crease I could never use it to blend my eyeshadow up out of my socket as it already had colour on it and its just too much of a faff to wash and wait, so naturally I needed another brush. Instead of getting another MAC 217 I spotted a NYX shading brush in a make up outlet store in Wales whilst on a visit. The thing that attracted me to this brush was the wideness of the brush, and how packed in the bristles were yet how soft it was. Its very flexible and less dense than the MAC 217 and feels nice and soft on the skin, and when being used it gently pushes the shadow out and away leaving a lovely blended effect. Since my first time of using it, I knew that this was going to be used everyday. The long story short: Apply lid colour with any flat shadow brush. Crease colour with the MAC 217. NYX shading brush with a little champange shade from the Urban Decay Naked palette on it which I find helps to blur out the edge of the shadow. Some of you might think I use these brushes for the wrong things, but I do believe that brushes like this can have multiple uses and everyone gets along with different things better than others. 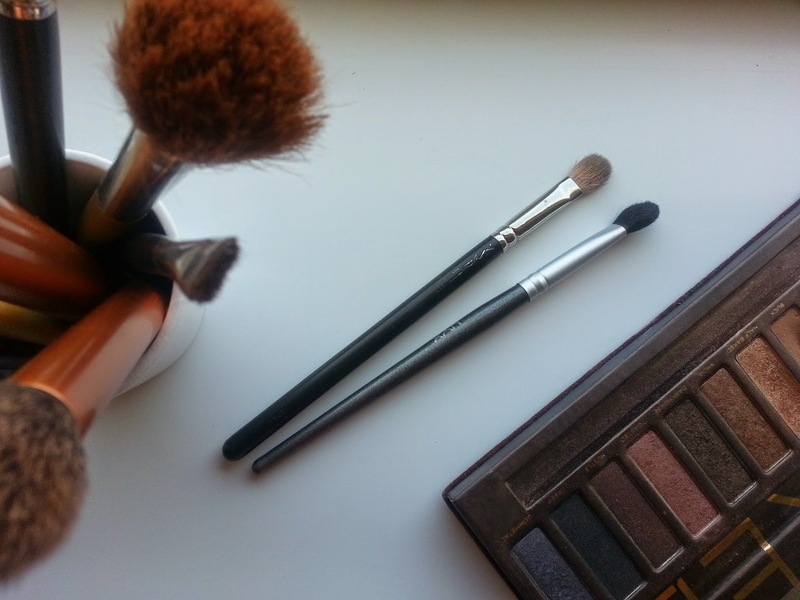 I am on the look out for some more eye brushes and would love some recommendations from you. I have been lusting over Bobbi Brown Sweep, Smudge and Shadow brushes on their website for a while but haven't been brave enough to part with the money. Thanks so much for reading, hope your having a great hump day! Taking your face off....with water? Nothing feels nicer than taking your face off after a long day. The fresh baby faced feeling I enjoy oh so much, however getting your make up off includes a lot of effort and I do not look forward to that part. Especially for people like myself that only wear waterproof mascara. I have always wanted to try Bioderma which on the grapevine is the best cleansing water. 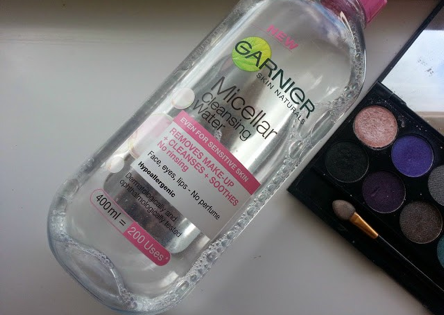 From one reason to the next I have never tried it so when I spotted this 'Garnier Cleansing Water' in my local Boots I grabbed it and thought why not. I have used this product for quite a while and have had three bottles since my first purchase. So the fact I have repurchased says enough about how much I like it. Taking your base make up off with this is very quick an easy and I use around two cotton pads for my whole face and neck. If its a day when I have packed on the mascara then I have to use a least 2 pads per eye. I hold them down on my eyes, have a little dance around for ten seconds maybe a little sing song, give them a little wiggle around and repeat when needed. I have had to use 4 on each eye before after a night out! Major effort! It doesn't leave my skin feeling dry, but feels very fresh and clean. After I have used the 'Garnier Cleansing Water' I use my 'Liz Earle Cleanse and Polish' to actually cleanse my skin. I feel that because I have used the Garnier to take off my make up, I want to use something else afterwards. I really do like this cleansing water and for the price its great as its so affordable. It lasts a while and most certainly removes make up well and soothes the skin. I still would like to try Bioderma and see if it manages to take my make up off easier than this. Much love, hope you've had a nice Monday. So another weekend is over and getting closer to the big day in December. I swear I am an adult but I love Christmas and I have to admit I am getting excited. Anyway I hope that you all had a lovely weekend full of laughs, food, trips, shopping, friends and family which is the standard menu for my weekends.I really did appreciate the weather this weekend however even though it was nice and sunny, there was still a chill in the air so my attire needed to be versatile for both weather conditions. I kicked myself for leaving my sunglasses at home but hey ho, good job I had put SPF on my face. 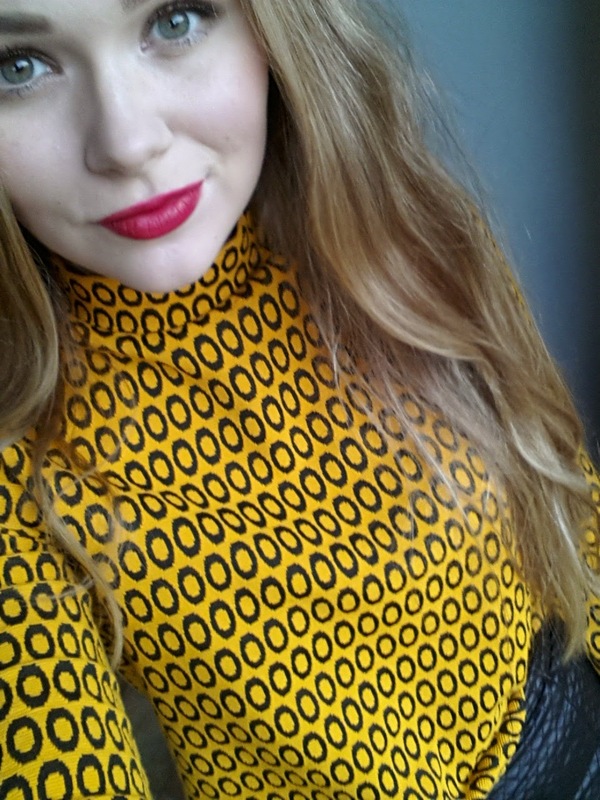 High neck crop top- Topshop - This is new and I am in love! Very sixties/vintage looking which is right up my street and a gorgeous bright mustard colour. The material is thick so its nice and warm but being a crop it keeps you cool when the sun comes out. 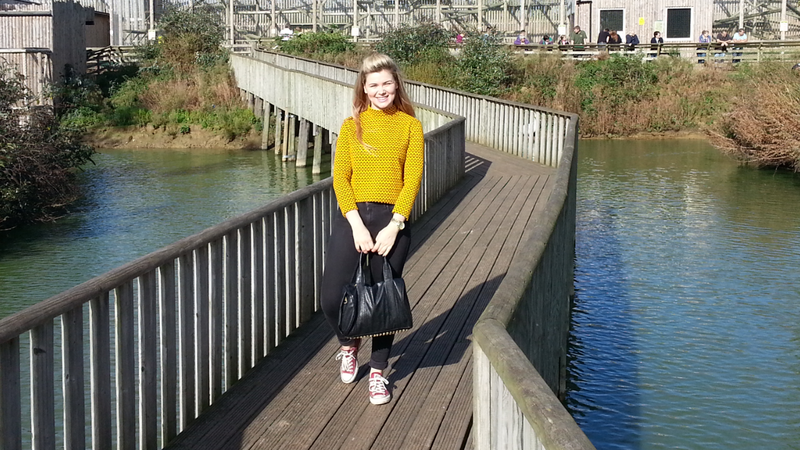 Leigh Jeans- Topshop - My trusty jeans that I have had for ages and ages. Probably for too long, but they are just so comfortable and I really dislike jean shopping. So unless they rip, they will be staying with me for a while yet. Shoes- Converse - A comfy shoe for walking around in and having weekend adventures in. I live in trainers/pumps at weekends for the sole reason that they are comfy (must be getting old ey). Bag- Ebay- A few years ago these were so popular and a Youtube and blogger craze started over these Alexander Wang Rocco rip off bags. Mine is still going strong with a small rip on the inside but I love it all the same and just gives an outfit a bit of edge. Watch- Michael Kors- This was a birthday present a couple of years ago. Still love it, however I am lusting over a certain DW watch at the moment. It is just so sleek, classic and gorgeous. I'm more of a shower person really, but everyone that knows me will agree that I'm a sucker for bath bombs. Anything that transforms a normal mundane bath into something a bit special then I'm there. I'm normally spotted with a Lush bag in hand, however when I was wondering around Superdrug last I spotted the Zoella Fizz Bar. I had seen her range on various YouTube channels and Blogs and wanted to try something anyway, so naturally the Fizz bar came home with me. The cubes allow the bath fizzer to last ages! For the price of it, its a great bath bomb as it can last for so long. 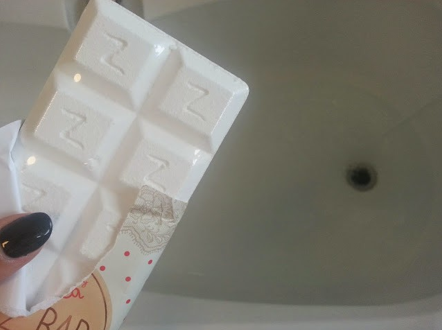 It's one of those things that adds just a little bit of something special to bathtime and gives your body a nice fresh fragrance for when you get out. It's not in your face fancy like some that you can get however does exactly what it says on the tin and adds some fizz to your bath. Having watched Zoes YouTube and followed her blog for years it is obvious that she has put so much of her own tastes and heart into this range and it really is lovely. Thanks for reading. I would love to know if you have any of the products that Zoe has brought out and your thoughts on them. You can buy Zoella beauty products from Superdrug and Feel Unique, go check it out! I am normally sporting an orange/red on my lips, MAC Morange one of my all time favourites. However since the shift in weather I have found my taste in lip colours have changed. I have been enjoying a nice pop of colour more so vintage pink through to dark plum, all of which I have more multiple times this month and will continue to up to christmas I'm sure. I own all of the Cream puff range from Collection 2000 (rebranded as Collection) and feel like you can't go wrong with them. They are that easy to apply that you don't need a mirror, and also very buildable to create a block of colour as well as a hint. I found it a bit strange when I first used one as when its dry it turns completely matte. This colour is a bit of an off colour and can't quite put my finger on however to describe the colour. It looks great teamed with a peach blusher and gives a nice flush of colour to the face. This has to be a lipstick that everyone has right? Its just the perfect vintage red. I haven't had it long but since my sister brought it back from New York for me I have been so in love with it and used it a lot. Its a matte finish however glides onto the lips without it being too drying. It doesn't budge once applied and doesn't even transfer onto cups much because of the matte finish. The colour pay off is great and will always be one of my go to reds. Would look great as a christmas lip colour for a party or for the big day itself. This has only been in my collection for a week and is very similar to Ruby woo I know. The colour, yes is incredibly similar however the finish and the application is so different. This lip crayon is basically Ruby Woo but more velvety and smooth with a bit of shine. I normally find lip crayons drying on the lips, but this is very much the opposite. I will say though that it transfers quite a bit onto glasses and things so I secure it with lipcote (which is swear by). Maybelline don't have a big range of these however I will be having a look at the other shades next time I'm in town. Last but not least is this dark red/purple beauty from MAC. 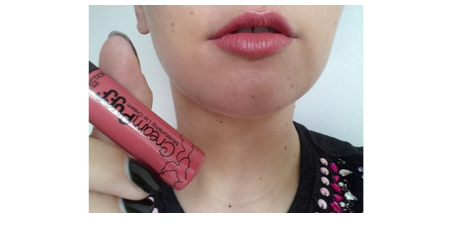 With its amplified finish it definitely stands out on the lips and will get you noticed in a crowd. It looks gorgeous packed on with dark eyes, however it also looks just as nice dabbed onto the lips and smudged in. I have to take my time with the application of this product as the colour stains so easily and I can get a bit messy. I wore this the other day dabbed onto the lips for a subtle hint of colour and put some Lipcote on the top to secure it. 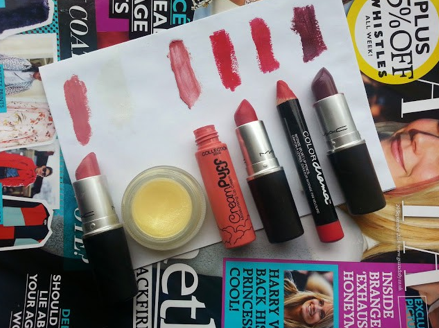 So these are my top 5 (one combo) lip products for autumn. I'm sure I will be using other products but these will be the ones I grab first. What lip colours are you into at the moment? Do you have any to recommend? Have you got any of these and think anything different? I say YES to cucumbers ! Myself and my mum like to follow the advice from the lovely Caroline Hirons, that you don't need to break the bank on a moisturiser. Although I'm sure its lovely to use one that costs an arm and a leg I would prefer to use something more affordable. So I have kept this is mind from that day and am always looking for something that is affordable and does what it says on the tin. I found this whilst browsing around my local Boots and spotted this new section of 'Yes to' products. They have a range for all skin types depending on whether you have sensitive skin, normal to dry, combination and acne-prone, fine lines and wrinkles and lastly uneven skin tone. 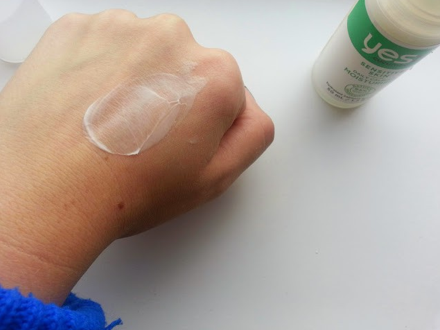 'Yes to' are 95% natural and are paraben, SLS and phthalates free. 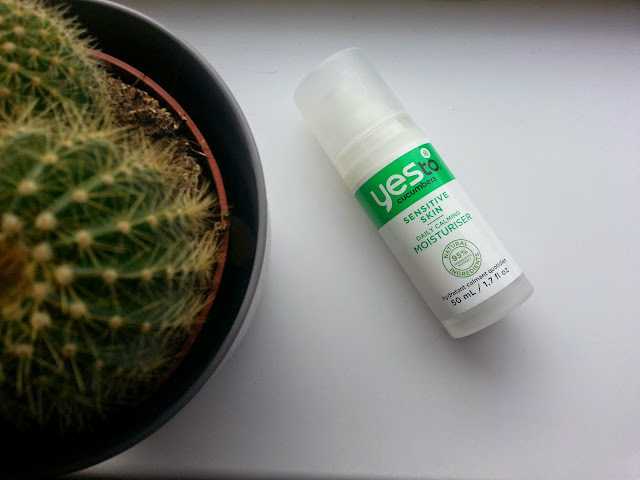 I chose to go with the sensitive skin moisturiser as my skin can be a little unpredictable when it comes to new products and I am just best going for it if it's available. After using this for a week now I can honestly say I look forward to applying it in the mornings. The consistency is thick however when smoothed onto the skin you can almost feel it sinking in and leaves it feeling fresh and smooth. The product has a slight cucumber smell which on its own smell fresh and is a nice smell to apply first thing in the morning. Straight after applying the moisturiser I start my make up and this just leaves such a lovely feel to the skin that tint/BB cream/foundation just glides on and it feels like a match made in heaven. Whilst having this I've have stopped using a make up primer because this gives such a great make up base. Yes to sensitive skin moisturiser retails in boots for £11.99 which I don't think is a bad price at all. It's quite a big size and will last w while as I only need to use a large pea sized amount. I will certainly be re-purchasing it and will recommend it to family or friends who are looking for something along this description. Thank you for reading, see you Wednesday! When I finally tear myself away from the pastel nail varnishes and a neutral quick and easy eyeshadow routine from spring and summer, I like to go with some nice colourful Autumnal vibes to see me through to winter. I really enjoy adding colour to my eyelids in autumn, especially with these colours that I have in my go to quad right now. All of these eyeshadow are MAC and they are kept in a MAC quad pro pallet. Antiqued (Top right)- This is one of my newest eyeshadows and am yet to use it properly. However saying this I am wearing it tomorrow for my boyfriends birthday meal so I will get a snap of how it looks and post it on Instagram and Twitter. I was drawn to this shade in MAC the other day as I had been seeing so much red/burnt red on the eyes and lips in various magazines and loved how it looked. I was torn between Antiqued and Cranberry and went with this as it has a slight bronzed colour running through it instead of literally just red which is what Cranberry is like. 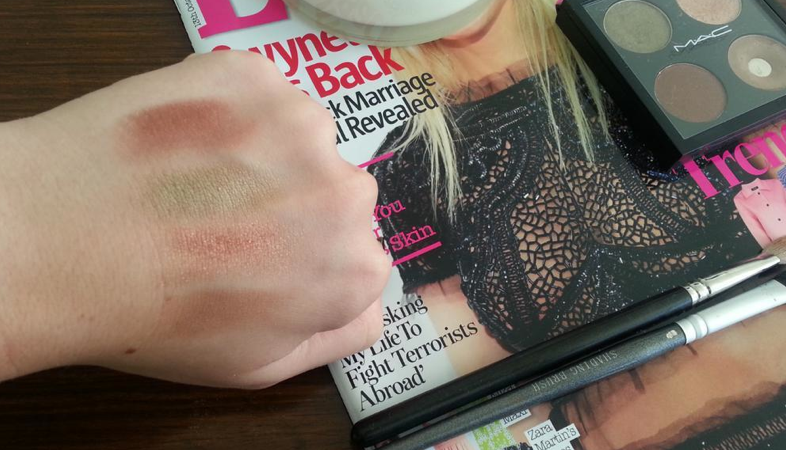 Its quite pigmented as you can see on the swatch below and holds a little shimmer in there as well. I love red eyes and a dark berry lip at the moment. Sumptuous Olive (Top right)- Believe it or not I have used this shadow quite a number of times however kinda looks untouched. This is lovely with anyone with green eyes (like myself) just packed on all over the lid and blended out. When it catches the light you see some gold running through which in some lights almost looks metallic. You can easily use this shade alongside a crease colour to give your eyes some more dimension. Cork (Bottom right)- I like to use cork for my everyday crease colour simply because it is close to my eyebrow colour and its not too intense for during the day. It has no shimmer what so ever so makes a good shadow to mix in with a shimmer to make the eye a bit more interesting. 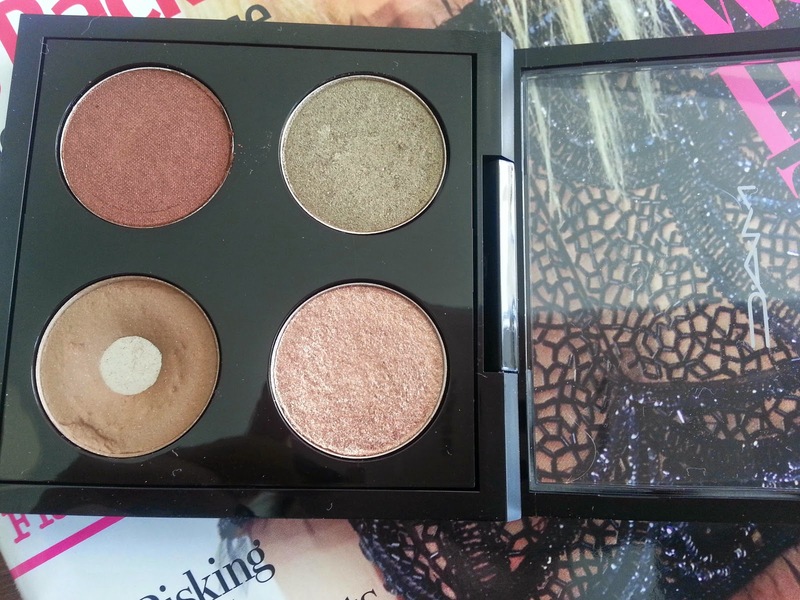 Its not very pigmented with just one swipe but can be easily built up and layered for a darker colour. I have used this with both Sumptuous Olive and Honey Lust and works well. Honey Lust (Bottom right)- This was a shadow that I didn't particularly like when I first got it. I felt it was too pink and the colour pay of wasn't great on its own. After experimenting I found that using a cream eyeshadow base of a champagne colour worked well underneath Honey Lust and gave it something to hold on to. Once given a base this shadow was able to be layered and can be built up to a very nice pinky coppery shade which makes greens eyes really pop. I never use this on its own as it is quite shimmery and I feel on me needs the cork n the crease to just bring it down to a casual level. These are the four shades that I am reaching for at the moment. I find that all four work well with a variety of different lipstick colours which is great for me being a crazy lipstick lady. What are you wearing on your eyelids at the moment? Do you have any recommendations for me? Thanks for reading! See you on Sunday. "Are you wearing false eyelashes"
So I have a small confession to make.... this post is late due to the fact the GBBO final was on and also TOWIE and I am kind of a big fan of them both. I am sorry. I hope you forgive me and my taste in television. 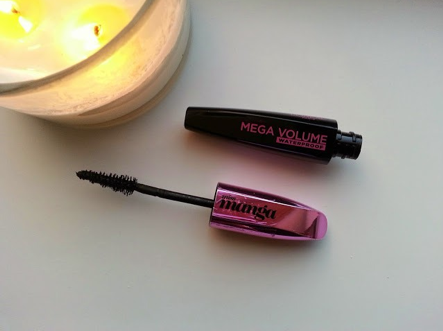 I must have a thing for Loreal mascaras as this baby was on offer in Boots and I had to buy it one because of the packaging and two because I like Manga. I didn't think much of it to start with as this was just a sort of experiment for me as I already had my love for the False Lash Effect. I was initially nervous about using this applicator as it is very tapered and rather thick and heavy looking. 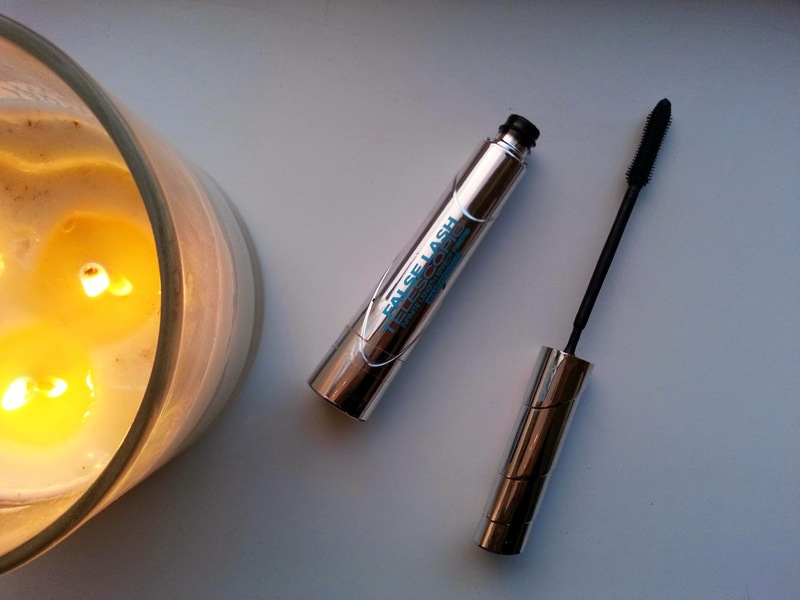 In fact when applied with a light hand it gave a lovely delicate look to my lashes, however I couldn't stop layering and layering and my lashes looked great and I am going to put it out there.... better than the False Lash! This does not budge no matter how many hours I have it on. I get no black flakes or any black rub offs with this mascara and I am now in love with this and it will take a miracle for another one to top this. If you have a mascara that you feel can take the challenge I would LOVE to hear about it. Hope the weekend was a goodern for you all and you enjoyed the sun that was around in the Kent area. Was a glorious Sunday! Do you think bigger is better? I have always lusted over people with lovely full, bouncy hair. So I purchased this combo from Feel Unique hoping for that exact effect. What is my hair like: My hair is thin and long, but I have lots of it so it gives the illusion that its thick. If I'm not careful it can look quite limp and flat if I just leave it without doing anything. 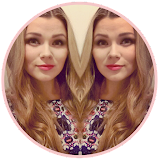 I have tried countless products that have left my hair sticky, clumpy and greasy and was desperate for something to work with a more natural feel. I have been using this product for a year now and this is my second lot because I loved it so much. It's quite a rich formula and if I use it too often it can be too heavy for my hair and it becomes greasy quickly and doesn't have a very nice bouncy effect. I'm into a routine of using this on a Sunday/Monday and then on a Thursday/Friday (all depending on what my plans are). When I haven't got any social plans it stays in the bathroom cupboard until the following week so it feels like a treat! When in the shower it foams up amazingly and a little definitely goes along way. The smell is nice and refreshing and is a joy to use. It does take a while to wash out as the formula is so thick so prepare for arm ache. Once out of the shower I blow dry my hair upside down to help with my lack of volume problem. I have however found that I can blow dry my hair upright after having used this combo. I have found it even better if I pull the hair up and away from the root. When it's completely dry it feels so luxurious, just like when you come out of the hairdressers! It's lovely and silky smooth however feels thick bouncy and helps give you a natural looking boost. What do you use to get a bit of volume in your hair? Shampoo and conditioner? Or special root boosting products? I would love to know.